Reduced Magnesium (Mg) intake is a frequent cause of Mg deficit with age. A decreased intestinal Mg absorption and an increased Mg loss may also contribute, as well as the use of medicaments. Furthermore, Mg requirements may be higher with aging. 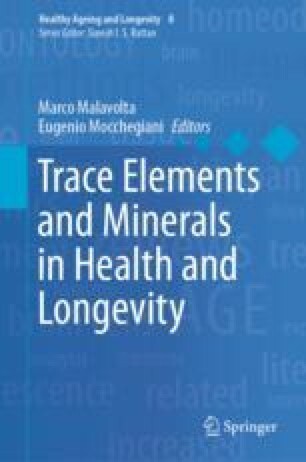 Alterations of Mg metabolism with age, cellular Mg transport systems and problems with measurement methods are discussed. Mg contained in water is more bio-available than Mg in food and it is a possible alternative to Mg supplementation in the correction of Mg deficiencies. Mild to moderate Mg deficits are generally asymptomatic and clinical signs are usually absent or non-specific. Hyperemotionality, tremor, asthenia, sleep disorders, and amnesic and cognitive disturbances are frequent in older adults, and may be often overlooked or confused with age-related symptoms. Chronic Mg deficiency results in oxidative stress and chronic, low-grade inflammation, which may be linked to several age-related diseases, and to the aging process itself. Mg deficit-related conditions may involve different tissues and organs, including hypertension and cardiovascular diseases, diabetes mellitus and metabolic syndrome, asthma and airways constrictive syndromes, depression and psychiatric disorders, Alzheimer’s disease and neuromuscular diseases (chronic fatigue, muscle pain, fibromyalgia), fragility fractures, and cancer. Keeping an optimal Mg balance throughout life might help to prevent some chronic disease associated to aging, and to extend healthy life. This needs to be proven by future studies.